Marc Darcy has taken Apache by storm since we first started stocking it last year. Given that Marc Darcy won Drapers magazine Menswear Brand of the Year for 2017/18, we’re not surprised. 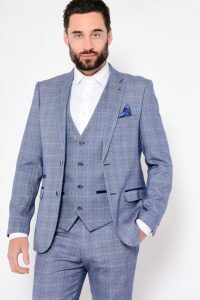 Our customers love their classy, well made jackets and trousers — not to mention the ultra-affordable prices — so here’s a run-down of the new Marc Darcy SS18 range. These outfits are great for all sorts of events: weddings, summer parties, days at the races, birthday dinners… you name it. You can mix and match sizes to fit you perfectly; maybe you’re a big chested guy with a slim waist, or vice versa. This month we’re offering a 10% discount code on all Marc Darcy SS18 gear — just type in MARC2018 at online checkout. 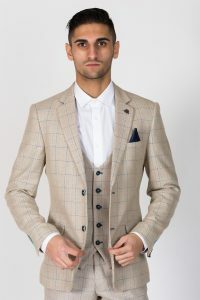 This cream blazer jacket is surely the most eye-catching garment in our Marc Darcy SS18 collection. Look closely and you’ll see a subtle multi-coloured check, perfect for matching with our wide range of smart casual shirts. The inside has a spectacular paisley lining, electric blue and pink, with a matching pocket hankie to round off the look. Ornate matching buttons and a Marc Darcy lapel pin badge are nice added touches. Sizes range from 38in to 48in. 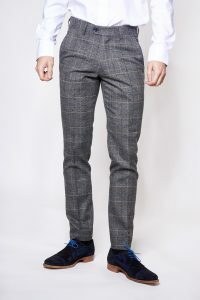 Marc Darcy SS18 season trousers are cut in a simple tapered fit that the vast majority of our customers prefer. Rather like our slim tapered jeans, they’re generous enough around the thighs to suit cyclists and gym guys. Sizes run from 30in to 38in, and the waist is adjustable to suit those who fall in between sizes. 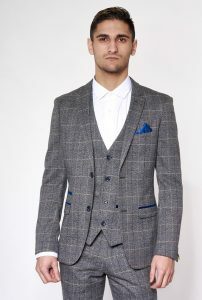 Here’s a more sober suit for your consideration, made with a tweed style fabric. We’re very fond of the classic navy blue lining with a kind of fleur-de-lis retro pattern, along with a matching pocket square. The front pockets have a blue suede trim, and there’s plenty of interior pockets for security. Understated but classy, the “Scott” outfit is a real winner. Don’t forget to use our special discount code MARC2018 for 10% off all new Marc Darcy SS18 gear!